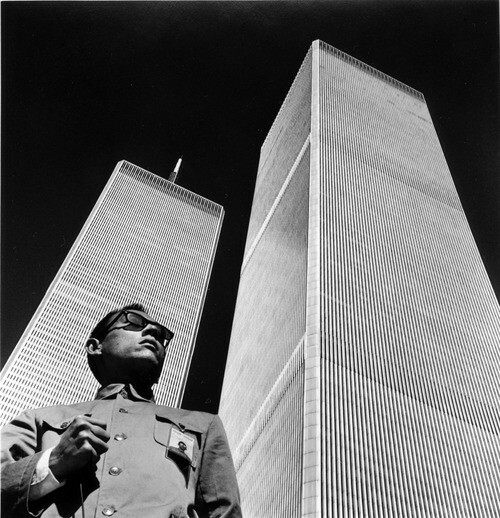 Tseng Kwong Chi was a Hong Kong born photographer active in the New York Art Scene in the 1970s and 80s. Son of an exiled Chinese nationalist, he lived a legendary life, moving from cities to cities, studying art and finally settling down in East Village in the comrade of emerging artists. He is the pioneer in identity politics, one of the first that opened the discourse of multiculturalism. 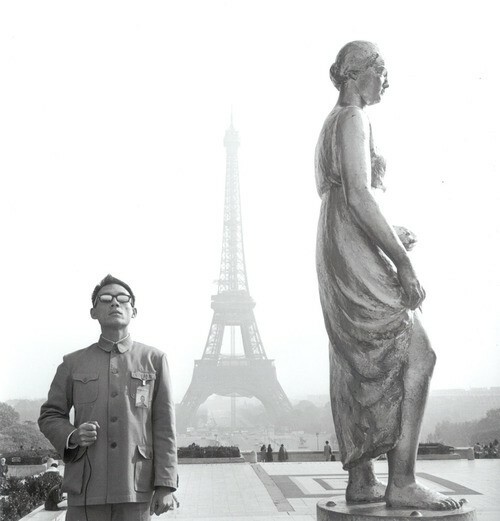 His most well-known series of self portraits of his posing in front of famous tourist attraction in a Mao suit are now showing in Ben Brown Fine Art in the artists intended mural sized format. I had the pleasure to interview the director of Tseng’s estate, Tseng’s sister and choreographer, Muna Tseng in December on Kwong Chi’s life and work. 1. What brought the family from Hong Kong to Canada, Paris and later settling at New York? How was the journey like? The journey started with my parents leaving China, and Kwong Chi was born in Hong Kong in 1950. Our childhood in Hong Kong was quite idyllic. He went to St. Joseph Boys College. He was 16 years old when we left to Vancouver, Canada during the unrest in Hong Kong in 1966. My family thought we should stay together, the entire family immigrated to Canada. I think it was rather traumatic to both Kwong Chi and me. As adolescent in Vancouver, it was quite a shock, so when Kwong Chi went to College, first in Montreal and then in Paris, it really felt like he had found where he wanted to be. He studied art, which was his passion and after that arriving to New York was really like a dream come true. We both came to New York to be an artist in 1978 and he befriended a group of artists in downtown New York, which was very vibrant. It was a long journey. I think his artistic persona and maturity as an artist finally began when he found his place in New York. 2. Was he always an artist? Yes. Ever since a child, he was very proficient in Chinese painting, he studied ink and calligraphy painting and he was very good. He could copy anything. He was kind of a rebel, even as a child he would not just copy things. You know how the Chinese education encourages exact copying of famous paintings and calligraphy. He would always have his own flare, his own personal take on things. Even as a child prodigy in Hong Kong, he had already shown a lot of promise. In Vancouver, he did some huge murals for the high school. It was a natural calling really. When he first went to Paris, he started with paintings. He found it rather lonely painting in the studio. He preferred to engage with people in the streets with his camera. He was very much inspired by Bresson, Lartigue and other french photographers. 3. How his training in Paris prepare him as an artist? I think it was very seminal. The training was excellent. The Académie Julian was where Matisse studied. He learnt a lot of technical knowledge and was inspired by beauty all around the city. His eye was very much shaped in Paris. He would often go to museums and be exposed to great arts through the ages. 4. How is the art scene in NYC like when You and Kwong-chi arrive at the scene in 1978, particularly in the point of view from a foreign artist? It was a very vibrant downtown scene. Kwong Chi never wanted to be identified as an Asian artist. 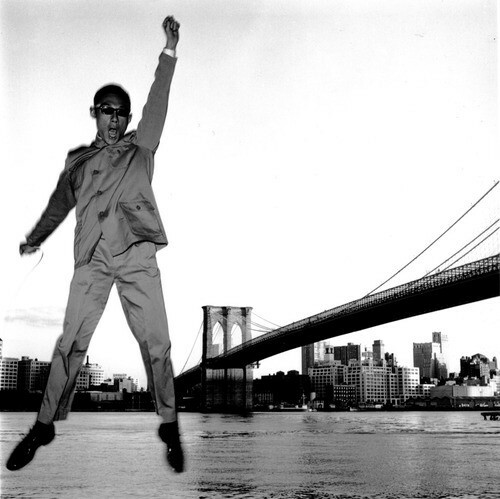 One of the first people he met in New York was Keith Haring in the East Village. That is where we lived. He became very good friends with Keith, as well as with Kenny Scharf and art students from School of Visual Arts. They became a tight circle. I was part of the dance world in New York. I was invited to join a professional dance company when I arrived. We were very lucky to find our place fairly quickly and began our lives there as artists. 5. How does his friendship with Keith Haring, Basquiat and other artists inspire and influence his work? It is a “fluid” kind of time. They were constantly collaborating, exchanging works. Kwong Chi would photograph all of Keith’s shows. He travelled with him. All the photographs would have a very clear point of view and style. You could look at a photo by Kwong Chi of Keith, and it would look very different from other people’s photographs of Keith. He was never interested in taking a photograph of a work of art on the wall as documentary, he wanted to capture the spirit, the climate, the gustos of all the people. I think he was very clear with his own style of photography in his self portrait series. It is very formal and many of the compositions have such classical beauty. It always has a conceptual backbone to it, which blends with performance art and using the self. Timothy Greenfield Sanders once described Kwong Chi’s work as ‘Ansel Adams meet Cindy Sherman’. You look at some of his beautiful landscapes, which resemble Ansel Adam, but the disguise in it, Who is He? There were a lot of dressing up and performing for the camera and for each other in that group. 6. How did the idea come to his mind? How was his research process? I think artists do not necessarily research and then after a lot of deliberation start doing things. I think artists have this sixth sense of some compulsion, impulse to make art. I think Kwong Chi’s impulse came quite early and it was somewhat sparked by this incident of our parents visiting us in New York and taking us to Windows of the World, which is the restaurant on top of the World Trade Towers. It was a fancy place and there was a dress code of suit and tie. Kwong Chi did not have a suit and tie, so he wore his Chinese uniform, the Mao suit, to the dinner. The matradee took one look at him and treated him like a VIP, thinking he was some sort of ambassador from China, and we got very excellent service. Something clicked in him, he never told anybody that he was going to put on that uniform and went all over US and Europe and photographed against the backdrop of great cities and landscapes. His process was to go out and do it. He persisted in doing it over 10 years. He started in 1979, and his last photograph was taken in Italy in 1989. It takes a certain real believe in making rigorous body of work – never giving up, never changing and being very disciplined to go about it for 10 years like what he did. 7. 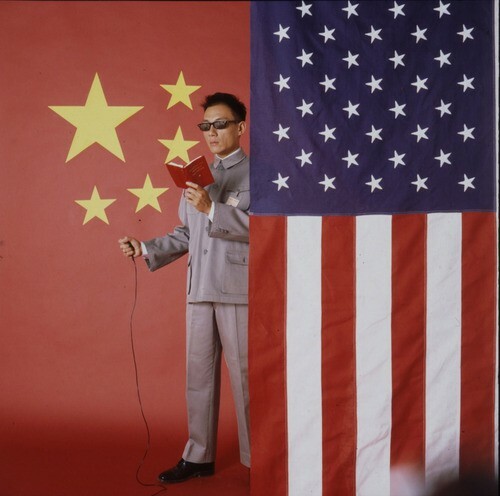 When I looked at his work, the sun glasses, the mao suit, the tourist photos, the artist’s pose, the self portraiture, I saw it as a visual representation of the Sino-US relationship in the 70s and 80s. What is the artist intention for the series? The series started with him reflecting on Nixon’s visit to China, and how the diplomatic relation was very official but superficial, nothing much was really being done. When I spoke about the artist impulse, tapping something that may rise up from the subconsciousness, Tseng was also informed of the world politics. He was very smart about his role in the world. Even though he was accepted into the “white downtown art world”, he was also apart from it. So I think the series is very smart in having these political underpinnings without it being “in your face” kind of slogan art. Instead of being confrontational, he thought the art should speak for itself. 8. Kwong Chi refers to himself as an ambiguous ambassador. Born in colonial Hong Kong. but grew up and received education in the western world. Was his identity always a crucial part of his art and his life? Yes, but the identity is a reflective one. One can have one own self of who he or she is, but the reflection is really how one is perceived by the outside world. In the 80s, there were really less focus on “foreignness”. It is not until the 1990s and 2000s that the academic circles started building theories around multiculturalism. In the days when Kwong Chi was making his work, I think there was less discussion and less dissecting of these issues. It is very interesting to think that in 2014 in Hong Kong with all the student protests, how people are perceiving these issues of identity, the West and the East, the marriage of the two. I think if he were alive today, he would be very interested in what is happening in Hong Kong and the issues that Hong Kong citizens have to grapple with. He would very much like to see the young people make protest and make art to address these identity issues in a more oblique way. Maybe the answer is not so straightforward. I think artists often provide answers that are not so black and white, posing the questions without giving the didactic answers.